This post is sponsored by DOLE® Canned 100% Pineapple Juice. 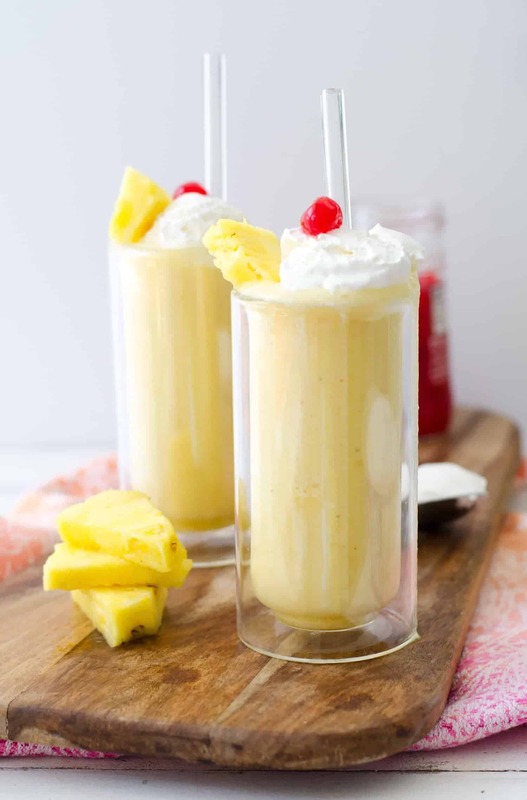 A piña colada smoothie! Perfect for mornings when you feel like a fancy umbrella-drink cocktail, but still have to face the realities of the day. Only on vacation are blended drinks an appropriate order at 10AM. But, this smoothie is the next best thing. I don’t know how, but I swear I feel a little more pep in my step when I sip on one of these for breakfast. It’s slightly exotic, refreshing, and a yummier alternative to orange juice. BL and I got really into pina-colada everything after our trip to Maui last summer. I think I ate fresh pineapple for every meal of the day, usually followed by a healthy serving of Dole Whip® afterwards (Dole Whip® = pineapple soft serve = vacation in a cup). We both came back from that trip in serious pineapple withdrawal, as our tropical vacation quickly morphed into St. Louis reality. I started making these pina-colada smoothies soon after and I’m surprised it’s taken me this long to share it with you today. Since our vacation plans this year sadly don’t include any tropical isles, this smoothie is the next best thing. Creamy, frothy, sweet. It’s Hawaii in a glass. Did I mention that this smoothie contains only four ingredients? Four! I’m betting you have most of them on hand already. 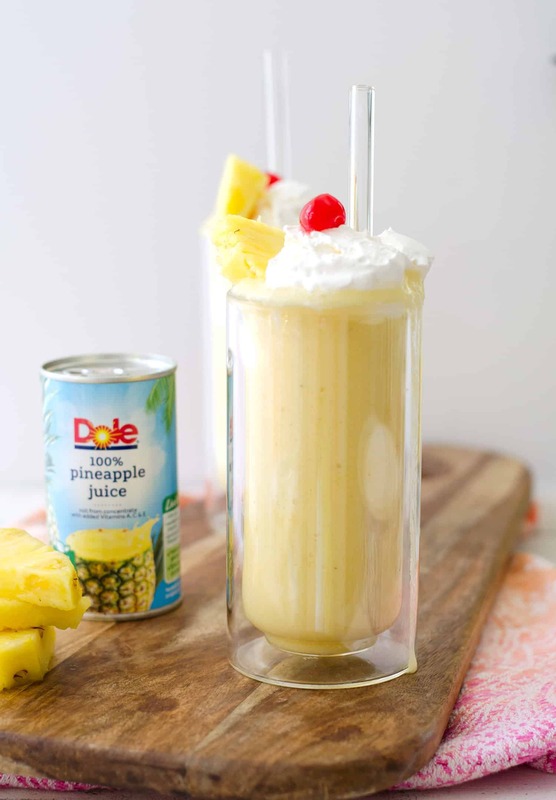 Frozen bananas for a creamy texture without the dairy, coconut milk beverage for the colada part, fresh pineapple cubes and of course, DOLE® Canned 100% Pineapple Juice. 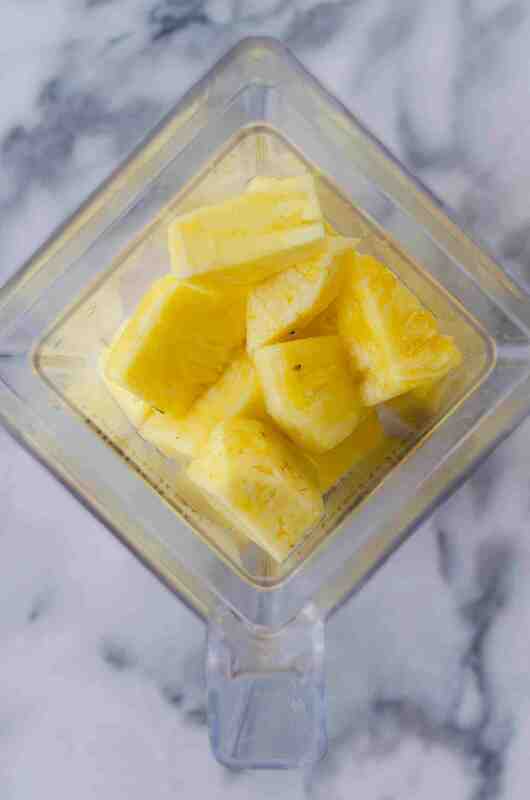 I love the tart, sweet taste that pineapple juice offers, on it’s own or in your favorite smoothie, mocktail or cocktail. This smoothie can go to cocktail in 60 seconds flat by adding in 1.5 ounces of rum. 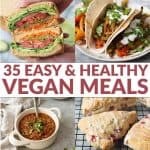 A smoothie that doubles as a cocktail? That’s my kinda summer beverage. The best thing about Dole pineapple juice is that it’s 100% juice, no added sugars, colors or flavorings, non-GMO and naturally gluten-free. Maybe that’s why it’s considered the King of Juices™. A piña colada smoothie! Perfect for mornings when you feel like a fancy umbrella-drink cocktail, but still have to face the realities of the day. It’s slightly exotic, refreshing, and a yummier alternative to orange juice. 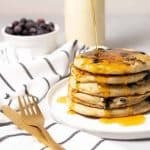 Place all ingredients in a high-powered blender and puree until creamy and smooth. 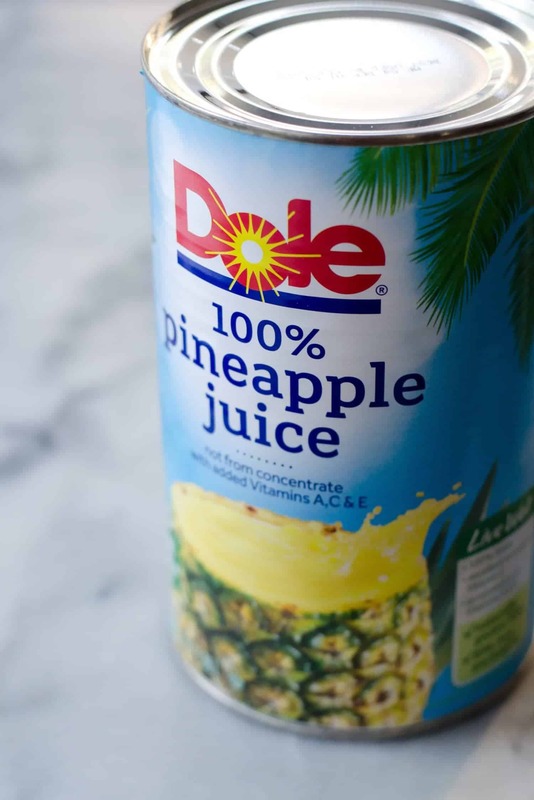 DOLE® Canned 100% Pineapple Juice, the ‘King of Juices™, is a natural way to add excitement to your favorite food and drink recipes. It’s a delicious change of pace that always delivers exhilarating flavor. Ah yes! The first smoothie I ever made was a pina colda smoothie 😉 Classic!